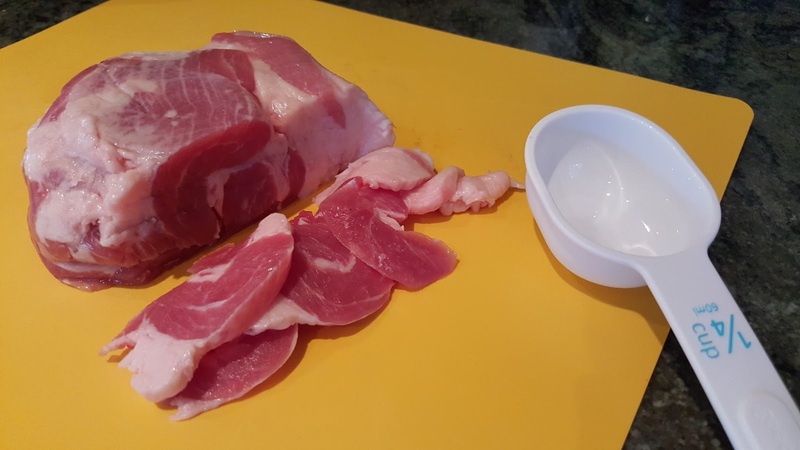 Cut the salt pork into cubes approximately 5 mm (or ⅜ in) in size. Wash and pat dry the beef and cut it into bite-size pieces. Toss the beef with the salt and black pepper. Peel the onions and cut them into small chunks. Peel the carrots and cut them into bite-size pieces. Remove any skin and rootlets from the celery root, and cut it into small chunks. Chop the garlic cloves or grind them with a pinch of salt in a molcajete. 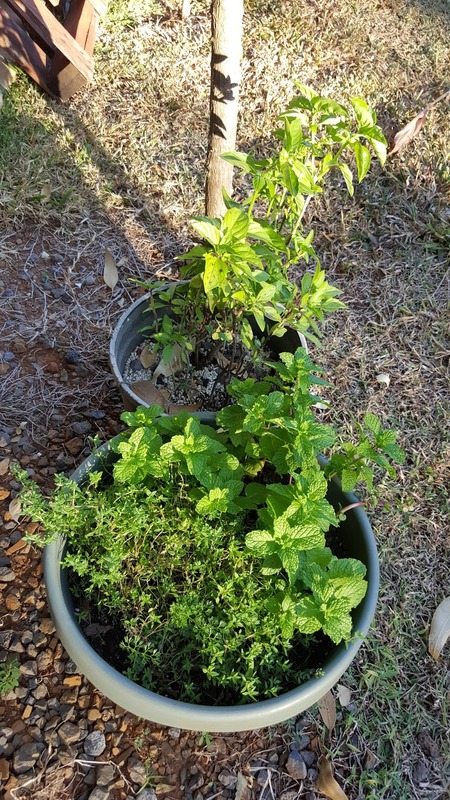 Rinse the herbs and strip off the leaves. 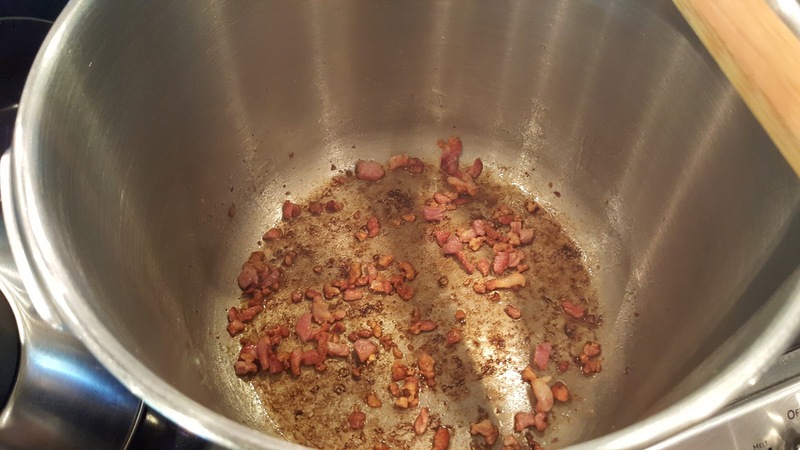 Place the salt pork cubes into the bottom of the pressure cooker over medium-high heat and stir them until the fat is rendered and the pork is browned. Remove the solid pieces and set aside. 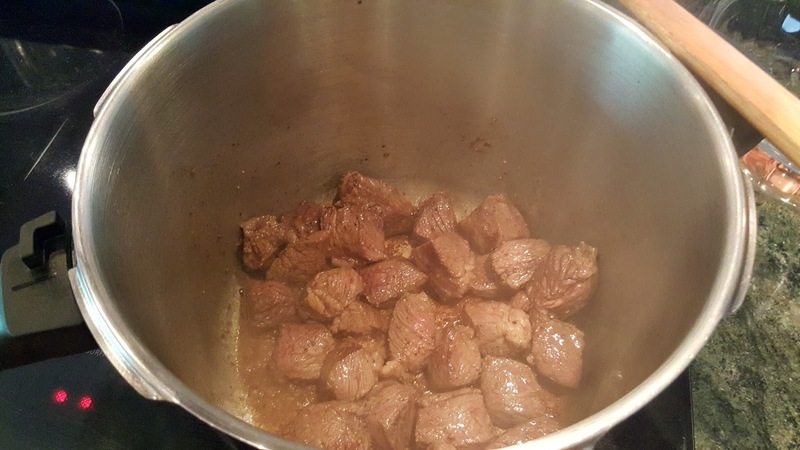 Place the cubes of beef into the bottom of the pressure cooker and brown them on all sides. Remove the beef and set it aside. Place about three quarters of the chopped onion into the bottom of the pressure cooker and sauté them until they begin to soften and change color. Reserve the remainder until step 19. Add the chopped carrot, celery root, and garlic and stir until the garlic no longer smells raw. Add the wine, beef stock, bay leaves, rosemary, oregano, thyme, basil, and fennel seed and stir in the mustard and tomato paste. Add the browned salt pork and beef, and fit the top onto the pressure cooker. Following the pressure cooker manufacturer's instructions, cook the beef and vegetable mixture at high pressure for 30 minutes (100 kPa, or 15 psi). 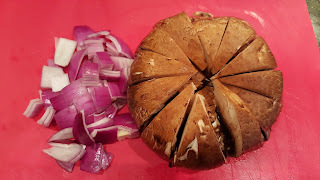 Meanwhile, wash the mushrooms and cut them into bite-size pieces. After the 30 minutes (or equivalent) of cooking, remove the pressure cooker from the heat, release the pressure valve according to manufacturer's instructions, and remove the lid. Place the remaining onion and the mushrooms into the pressure cooker and stir to distribute evenly. If there is little fluid in the pressure cooker, add 120 ml (or ½ cup) of water, or the minimum required for your pressure cooker. 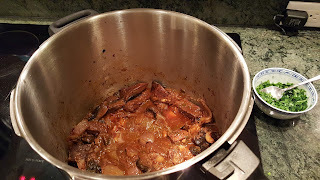 Replace the lid on the pressure cooker and, following the manufacturer's instructions, cook the stew at high pressure for 8 minutes (or the equivalent at low pressure). 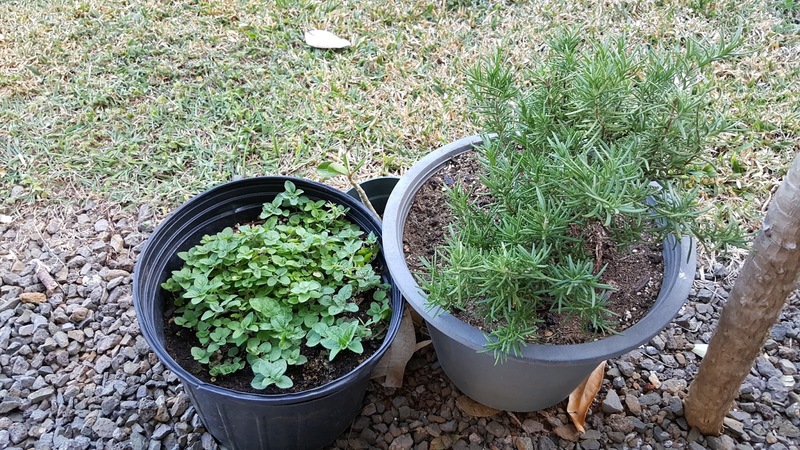 Meanwhile, chop the parsley and set it aside in a serving bowl. After the 8 minutes (or equivalent) of cooking, remove the pressure cooker from the heat, and allow the pressure to subside gradually. 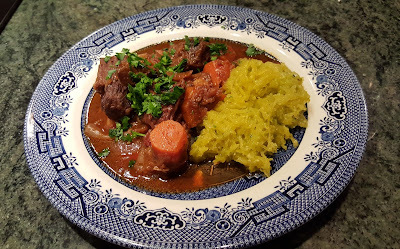 Serve the stew sprinkled with fresh parsley, or pass the parsley separately at the table. The inspiration for this dish came from The Decadent Diabetic, a blog that I follow. I adapted it for the pressure cooker, and added a little more vegetable. 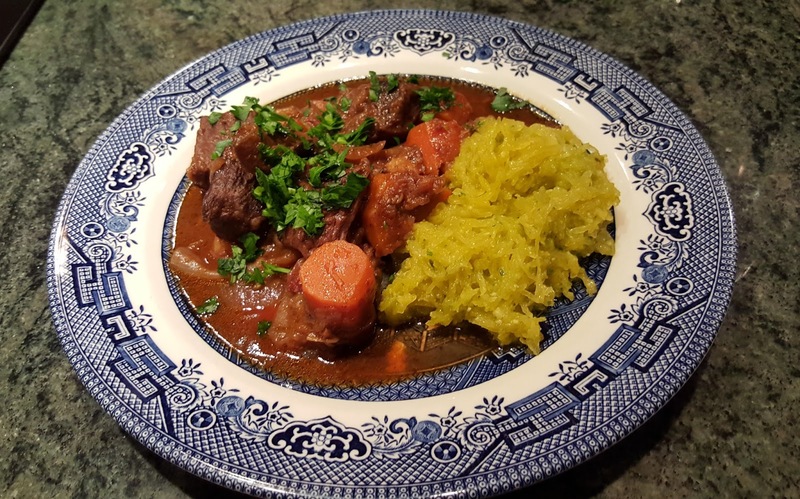 As recommended by The Decadent Diabetic, we ate our stew with spaghetti squash, using my recipe from this blog, Pesto-No-Pasta.